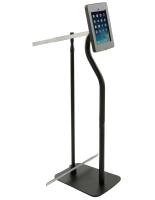 This iPad kiosk with adjustable banner comes complete with a sturdy black finish display stand and full color custom graphic. The locking tablet enclosure is a superior choice for showcasing interactive content to customers and passersby. 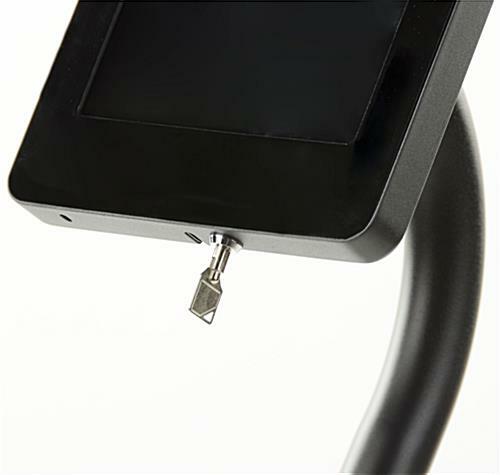 The Apple kiosk with adjustable banner locks for security and is designed to fit 2nd, 3rd, 4th generation tablets as well as the Air. 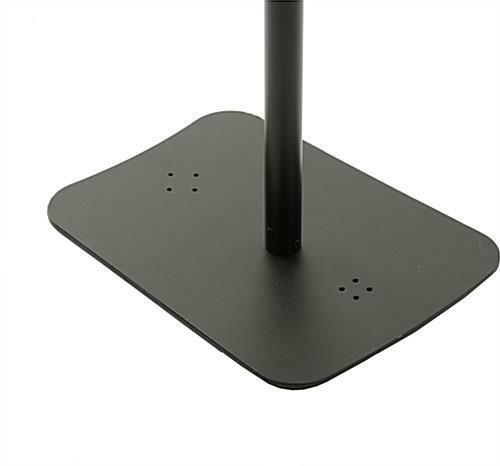 Each flat base stand has a pole support with angled design that allows the device enclosure to tilt and rotate for visibility. The eye-catching kiosk with adjustable full color banner is a perfect choice for high traffic areas where customers can be attracted by the custom printed graphics and then engaged by the interactive display. 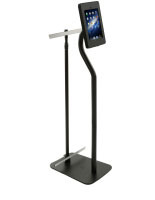 This type of fixture makes a great trade show display as well as everyday sales floor, lobby or gallery accessory.